Virtual reality (VR) and augmented reality (AR) tools are now relatively easy to access. But are consumers aware they’re using VR when they load a 360° video on Facebook or YouTube, and are Snapchatters aware that AR technology is powering their Lens filters? Whether they’re uploading photos or viewing videos on their favorite social media platforms, playing gaming apps, or making use of 360-degree photo capturing on their smartphones, consumers have the chance to enhance these experiences thanks to large ongoing cross-industry investments into AR and VR. But with much of the noise surrounding these technologies stemming from corporate press releases, it’s been difficult to gauge the current state of the AR or VR industries. Understanding the impact of corporate messaging surrounding AR and VR on consumer awareness, and how expectations are evolving, will give a much more holistic view of the current landscape. AR has an awareness issue. AR and VR content can come in many forms, and this could be a cause for confusion. There’s still not much clarity over whether consumers are aware these tools are available to them, or if they realize they’re engaging with AR or VR when they use them. In a recent research study we conducted in the UK and U.S., we found that over 90% of consumers in these markets are aware of VR, with around 65% saying they’re aware of AR. But whereas VR can boast impressive awareness levels across age and gender breaks, for AR it’s a different story. Awareness of AR hovers between the 70-75% mark among the 16-44 age group, but drops dramatically among 45-54s (56%) and 55-64s (44%). By gender, males (71%) display a notably higher level of awareness of AR compared to women (59%). 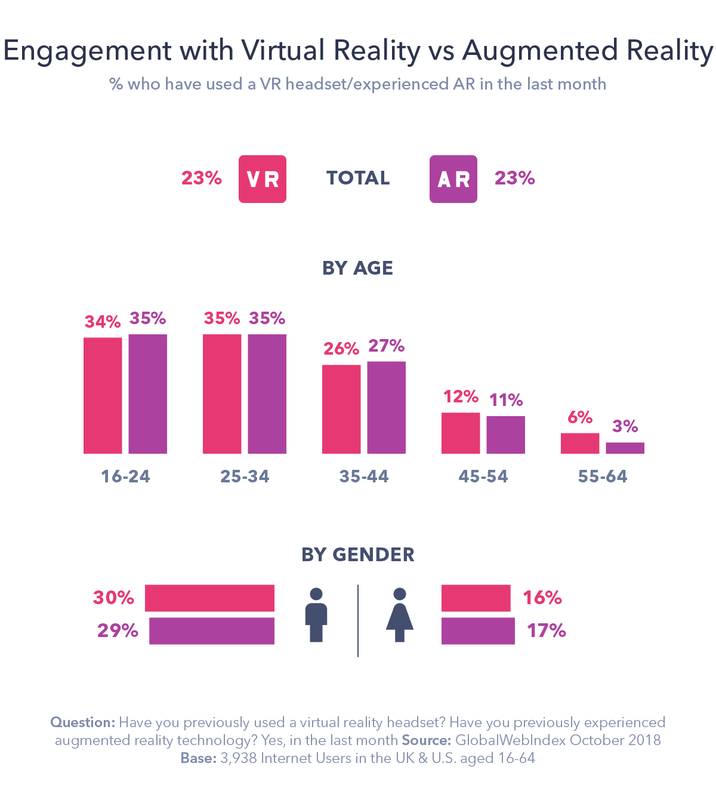 These awareness level figures stand in sharp contrast to the rate of consumers who are actually engaging with AR and VR on a monthly basis in the UK and U.S.
From this perspective, we can see that awareness levels completely overshadow engagement, although the two metrics do follow similar age and gender-based patterns. For both technologies, engagement is mainly clustered around the 16-34 age group, and to a lesser extent the 35-44 age group, with figures tailing off significantly thereafter. VR has a content challenge. Those who have used a VR headset in the past month were most likely to own the device (43%), although 31% said that they used a VR headset belonging to a friend and around 24% said that they accessed the device at an event or in-store. But when we rebase this among all internet users in the UK and U.S., access to VR headsets is primarily the result of using a friend’s device, not via personal ownership. Whether they’ve used a friend’s device or owned it, the majority (42%) of those who have used a VR headset in the past month described it as being in the mid-range VR market, which includes devices such as the Google Daydream or the Samsung Gear VR headsets. That said, an impressive 1 in 3 described the device as falling within the “high-end” market, including high-ticket devices such as the Oculus Rift, HTC Vive or PlayStation VR. Above all, hardware costs are cited as the most important issue consumers think VR tech is facing right now, and users of the high-end VR devices (54%) were more likely to say this compared to the budget (48%) or mid-range (50%) device users. For the market to grow, and for VR to prove its value to consumers, price-points need to adjust to consumer budgets to lower the entry barriers for the high-end devices. It’s these high-end devices which are having the most success in convincing users of the merits of VR. Our data shows users of the mid-range and particularly budget headsets are more likely to find issue with user interface features, and question the viability of VR. For example, the rate of those who say that “motion sickness when using VR” is a main issue decreases directly in line with rising price-points of the headsets. The same is true in the rate of those who say that VR still “feels gimmicky” or that they “don’t currently see a use-case for it yet”. Behind high hardware costs, users of VR were most likely to say that there’s currently not enough content on offer in the VR market. Frustrations with a lack of content on offer are equally as prevalent across the budget, mid-range and high-end device users. Although price-points emerge as the main issue for consumers, the content challenge also threatens to undermine the momentum in the growth of the VR market, and it’s a challenge which has been discussed for some time. VR’s presence in the gaming industry demonstrates the issue at hand. Although E3 2018 witnessed a handful of new VR gaming title announcements, the major event turned out to be light on information concerning developments of the tech. Many existing blockbuster VR games on offer weren’t originally designed with VR in mind, having been retrospectively adapted for VR at a later stage, which can affect the overall experience negatively. VR is an entertainment platform first, learning platform second. It’s not difficult to see why the gaming industry serves as such an important benchmark for the VR industry – its users overwhelmingly believe VR has the most potential in the gaming sector, with almost two-thirds saying this. Users of high-end devices had the highest hopes (73%) for VR’s potential in the gaming market, most likely due to the majority of consumer-facing demos of these devices showcasing immersive gaming experiences. Although it’s a significant step down, more than 40% of VR users do believe it has the strongest potential in enhancing sports viewing experiences. We’ve touched on VR’s potential in creating a more immersive experience in the non-traditional sports sector, but we’ve also seen some important developments among traditional sports leagues in the VR space. Having spearheaded its way into the esports scene, the NBA has also embraced tech-driven solutions for its conventional matches, committing to broadcasting every game in VR this season. From the consumer’s perspective, VR may be primarily for gaming, but for brands it can be an important marketing tool. The problem is, as demonstrated in our engagement figures, adoption isn’t yet big enough to justify the costs in creating a VR ad. Almost a quarter of VR users believe it has the strongest potential to improve marketing and advertising experiences. But while this falls well below the other options in our chart, it still indicates that brands will have an important opportunity to connect with consumers on a deeper level using this technology. AR: the opportunity for brands and marketers. Compared to VR, expectations on AR’s potential covered a broader array of industries. Again, gaming emerged as the top industry, but its lead is much narrower compared that seen with VR. Behind gaming and film and TV content, AR users believed this technology had the most potential in the social media industry. This will certainly be good news for Facebook, which has developed its AR Studio tools, and Snapchat, which has recently allowed advertisers to programmatically purchase AR-powered creative tools via its ad platform. Of course, this ties heavily into the potential of AR in advertising. Social media companies, above all, generate revenue by delivering ads, and their investments in AR are a way of improving these ad experiences. More than a third of AR users believe that its potential lies in the marketing and advertising industry. This is a figure which will likely grow as AR-enabled advertising is tied with other technologies, such as location-based tools, and becomes increasingly accessible on social media platforms. AR users also recognize its capabilities in improving the retail experience. More than 30% said that it has the strongest potential in enhancing shopping activities like researching products. 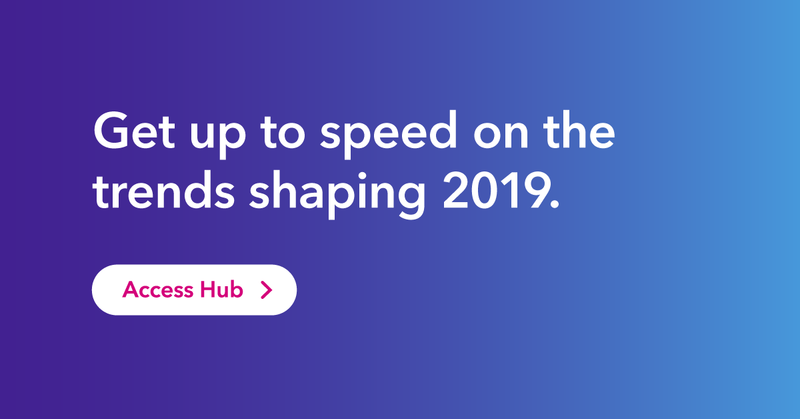 Our global research consistently shows the modern consumer will make the effort to inform themselves on what they’re buying before they commit to a purchase by using an increasing array of channels to guide their purchases. For example, almost 80% of global internet users say that the internet is the first point of call when they need information, but around 63% believe that there’s too much choice online. Not only might consumers be overwhelmed by choice, but the divide between online purchasing and actually seeing and testing products remains a major issue, especially in “high-touch” categories. 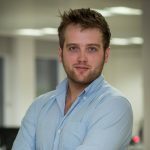 This is an issue which has contributed to the increasing costs to retailers dealing with rising consumer returns, as well as to the continuing showrooming trend. AR emerges as a way of bridging that gap, and plenty of retailers, including Amazon, have been quick to develop their own AR solutions to help consumers virtually test out products from the comfort of their home. Which will go mainstream first? With both technologies vying to transform the same industries, this raises the question of which will make the biggest impact first. We asked those who were aware of both AR and VR which they think has the highest likelihood of going mainstream first. The majority (53%) believed that VR had the strongest chance of hitting the mainstream first, with 34% choosing AR. That said, our data shows that post-engagement with VR and AR can yield entirely different results. Among those who have used AR and VR in the past month, they were more likely to believe in the potential of AR (50%) compared to VR (47%). For brands weighing up their entry into either technology, this has been a key question. It’s divided the likes of Amazon, Google, Apple and Facebook, and stirred up a great deal of conversation. In both cases, consumer understanding of these technologies still firmly roots them in the gaming industry for now. But to cross that threshold, they need to build out their presence in other high-exposure consumer categories. Our data shows AR currently has the highest likelihood of demonstrating its value beyond gaming, as consumers tend to see its potential across a much broader array of industries. A lot of AR’s potential lies in improving experiences when users are out and about shopping, taking photos to share on social media, or even just navigating their everyday lives. Put simply, AR has a more immediate opportunity to prove to consumers that it can play an important role in their everyday lives. Overcoming that challenge has helped spur growth in the voice assistant market, for example. The popularity and virality of Pokemon Go and Snapchat overlays have clearly demonstrated that once consumers are aware of AR tools, they’re quick to make use of them. Redirecting that enthusiasm into more practical solutions could be an important growth initiative in the near future for AR.